"History of Western philosophy" redirects here. For the 1945 book by Bertrand Russell, see A History of Western Philosophy. Western philosophy is the philosophical thought and work of the Western world. Historically, the term refers to the philosophical thinking of Western culture, beginning with Greek philosophy of the pre-Socratics such as Thales (c. 624 – c. 546 BC) and Pythagoras (c. 570 BC – c. 495 BC), and eventually covering a large area of the globe. The word philosophy itself originated from the Ancient Greek: philosophia (φιλοσοφία), literally, "the love of wisdom" (φιλεῖν philein, "to love" and σοφία sophia, "wisdom"). The scope of philosophy in the ancient understanding, and the writings of (at least some of) the ancient philosophers, were all intellectual endeavors. This included the problems of philosophy as they are understood today; but it also included many other disciplines, such as pure mathematics and natural sciences such as physics, astronomy, and biology (Aristotle, for example, wrote on all of these topics). Pythagoras, from the island of Samos off the coast of Ionia, later lived in Croton in southern Italy (Magna Graecia). Pythagoreans hold that "all is number," giving formal accounts in contrast to the previous material of the Ionians. They also believe in metempsychosis, the transmigration of souls, or reincarnation. A key figure in Greek philosophy is Socrates. Socrates studied under several Sophists but transformed Greek philosophy into a branch of philosophy that is still pursued today. It is said that following a visit to the Oracle of Delphi he spent much of his life questioning anyone in Athens who would engage him, in order to disprove the oracular prophecy that there would be no man wiser than Socrates. Socrates used a critical approach called the "elenchus" or Socratic method to examine people's views. He aimed to study human things: the good life, justice, beauty, and virtue. Although Socrates wrote nothing himself, some of his many disciples wrote down his conversations. He was tried for corrupting the youth and impiety by the Greek democracy. He was found guilty and sentenced to death. Although his friends offered to help him escape from prison, he chose to remain in Athens and abide by his principles. His execution consisted of drinking the poison hemlock and he died in 399 BC. Plato was a student of Socrates. Plato founded the Academy of Athens and wrote a number of dialogues, which applied the Socratic method of inquiry to examine philosophical problems. Some central ideas of Plato's dialogues are the immortality of the soul, the benefits of being just, that evil is ignorance, and the Theory of Forms. Forms are universal properties that constitute true reality and contrast with the changeable material things he called "becoming". Aristotle was a pupil of Plato. Aristotle was perhaps the first truly systematic philosopher and scientist. He wrote about physics, biology, zoology, metaphysics, aesthetics, poetry, theater, music, rhetoric, politics and logic. Aristotelian logic was the first type of logic to attempt to categorize every valid syllogism. Aristotle tutored Alexander the Great, who in turn conquered much of the ancient world at a rapid pace. Hellenization and Aristotelian philosophy exercised considerable influence on almost all subsequent Western and Middle Eastern philosophers, including Hellenistic, Roman, Byzantine, Western medieval, Jewish, and Islamic thinkers. Medieval philosophy is the philosophy of Western Europe and the Middle East during the Middle Ages, roughly extending from the Christianization of the Roman Empire until the Renaissance. Medieval philosophy is defined partly by the rediscovery and further development of classical Greek and Hellenistic philosophy, and partly by the need to address theological problems and to integrate the then widespread sacred doctrines of Abrahamic religion (Islam, Judaism, and Christianity) with secular learning. Early medieval philosophy was influenced by the likes of Stoicism, Neoplatonism, but, above all, the philosophy of Plato himself. Some problems discussed throughout this period are the relation of faith to reason, the existence and unity of God, the object of theology and metaphysics, the problems of knowledge, of universals, and of individuation. The prominent figure of this period was Augustine of Hippo (one of the most important Church Fathers in Western Christianity) who adopted Plato's thought and Christianized it in the 4th century and whose influence dominated medieval philosophy perhaps up to end of the era but was checked with the arrival of Aristotle's texts. Augustinianism was the preferred starting point for most philosophers (including Anselm of Canterbury, the father of scholasticism) up until the 13th century. The Carolingian Renaissance of the 8th/9th century was fed by Church missionaries travelling from Ireland, most notably John Scotus Eriugena, a Neoplatonic philosopher. The modern university system has roots in the European medieval university, which was created in Italy and evolved from Catholic Cathedral schools for the clergy during the High Middle Ages. Thomas Aquinas, an academic philosopher and the father of Thomism, was immensely influential in Catholic Europe; he placed a great emphasis on reason and argumentation, and was one of the first to use the new translation of Aristotle's metaphysical and epistemological writing. 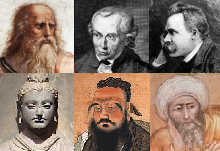 Philosophers from the Middle Ages include the Christian philosophers Augustine of Hippo, Boethius, Anselm, Gilbert de la Porrée, Peter Abelard, Roger Bacon, Bonaventure, Thomas Aquinas, Duns Scotus, William of Ockham and Jean Buridan; the Jewish philosophers Maimonides and Gersonides; and the Muslim philosophers Alkindus, Alfarabi, Alhazen, Avicenna, Algazel, Avempace, Abubacer, Ibn Khaldūn, and Averroes. The medieval tradition of scholasticism continued to flourish as late as the 17th century, in figures such as Francisco Suárez and John of St. Thomas. At the point of passage from Renaissance into early/classical modern philosophy, the dialogue was used as a primary style of writing by Renaissance philosophers, such as Giordano Bruno. The term "modern philosophy" has multiple usages. For example, Thomas Hobbes is sometimes considered the first modern philosopher because he applied a systematic method to political philosophy. By contrast, René Descartes is often considered the first modern philosopher because he grounded his philosophy in problems of knowledge, rather than problems of metaphysics. Some central topics of Western philosophy in its early modern (also classical modern) period include the nature of the mind and its relation to the body, the implications of the new natural sciences for traditional theological topics such as free will and God, and the emergence of a secular basis for moral and political philosophy. These trends first distinctively coalesce in Francis Bacon's call for a new, empirical program for expanding knowledge, and soon found massively influential form in the mechanical physics and rationalist metaphysics of René Descartes. Other notable modern philosophers include Baruch Spinoza, Gottfried Wilhelm Leibniz, John Locke, George Berkeley, David Hume, and Immanuel Kant. Many other contributors were philosophers, scientists, medical doctors, and politicians. A short list includes Galileo Galilei, Pierre Gassendi, Blaise Pascal, Nicolas Malebranche, Antonie van Leeuwenhoek, Christiaan Huygens, Isaac Newton, Christian Wolff, Montesquieu, Pierre Bayle, Thomas Reid, Jean le Rond d'Alembert, Adam Smith, and Jean-Jacques Rousseau. The approximate end of the early modern period is most often identified with Immanuel Kant's systematic attempt to limit metaphysics, justify scientific knowledge, and reconcile both of these with morality and freedom. Late modern philosophy is usually considered to begin around the pivotal year of 1781, when Gotthold Ephraim Lessing died and Kant's Critique of Pure Reason appeared. German philosophy exercised broad influence in this century, owing in part to the dominance of the German university system. German idealists, such as Johann Gottlieb Fichte, Friedrich Wilhelm Joseph Schelling, Georg Wilhelm Friedrich Hegel, and the members of Jena Romanticism (Friedrich Hölderlin, Novalis, and Karl Wilhelm Friedrich Schlegel), transformed the work of Kant by maintaining that the world is constituted by a rational or mind-like process, and as such is entirely knowable. Arthur Schopenhauer's identification of this world-constituting process as an irrational will to live influenced later 19th- and early 20th-century thinking, such as the work of Friedrich Nietzsche. The 19th century took the radical notions of self-organization and intrinsic order from Goethe and Kantian metaphysics, and proceeded to produce a long elaboration on the tension between systematization and organic development. Foremost was the work of Hegel, whose Phenomenology of Spirit (1807) and Science of Logic (1813–16) produced a "dialectical" framework for ordering of knowledge. As with the 18th century, developments in science arose from philosophy and also challenged philosophy: most importantly the work of Charles Darwin, which was based on the idea of organic self-regulation found in philosophers such as Smith, but fundamentally challenged established conceptions. Gottlob Frege and Henry Sidgwick, whose work in logic and ethics, respectively, provided the tools for early analytic philosophy. Charles Sanders Peirce and William James, who founded pragmatism. Søren Kierkegaard and Friedrich Nietzsche, who laid the groundwork for existentialism and post-structuralism. The three major contemporary approaches to academic philosophy are analytic philosophy, Continental philosophy and pragmatism. They are neither exhaustive nor mutually exclusive. The 20th century deals with the upheavals produced by a series of conflicts within philosophical discourse over the basis of knowledge, with classical certainties overthrown, and new social, economic, scientific and logical problems. 20th century philosophy was set for a series of attempts to reform and preserve, and to alter or abolish, older knowledge systems. Seminal figures include Bertrand Russell, Ludwig Wittgenstein, Edmund Husserl, Martin Heidegger, and Jean-Paul Sartre. The publication of Husserl's Logical Investigations (1900–1) and Russell's The Principles of Mathematics (1903) is considered to mark the beginning of 20th-century philosophy. The 20th century also saw the increasing professionalization of the discipline and the beginning of the current (contemporary) era of philosophy. Since the Second World War, contemporary philosophy has been divided mostly into analytic and Continental traditions; the former carried in the English speaking world and the latter on the continent of Europe. The perceived conflict between Continental and analytic schools of philosophy remains prominent, despite increasing skepticism regarding the distinction's usefulness. In the English-speaking world, analytic philosophy became the dominant school for much of the 20th century. The term "analytic philosophy" roughly designates a group of philosophical methods that stress detailed argumentation, attention to semantics, use of classical logic and non-classical logics and clarity of meaning above all other criteria. Though the movement has broadened, it was a cohesive school in the first half of the century. Analytic philosophers were shaped strongly by logical positivism, united by the notion that philosophical problems could and should be solved by attention to logic and language. Bertrand Russell and G.E. Moore are also often counted as founders of analytic philosophy, beginning with their rejection of British idealism, their defense of realism and the emphasis they laid on the legitimacy of analysis. Russell's classic works The Principles of Mathematics, "On Denoting" and Principia Mathematica (with Alfred North Whitehead), aside from greatly promoting the use of mathematical logic in philosophy, set the ground for much of the research program in the early stages of the analytic tradition, emphasizing such problems as: the reference of proper names, whether 'existence' is a property, the nature of propositions, the analysis of definite descriptions, and discussions on the foundations of mathematics. These works also explored issues of ontological commitment and metaphysical problems regarding time, the nature of matter, mind, persistence and change, which Russell often tackled with the aid of mathematical logic. Gottlob Frege's The Foundations of Arithmetic (1884) was the first analytic work, according to Michael Dummett (Origins of Analytical Philosophy (1993)). Frege took "the linguistic turn," analyzing philosophical problems through language. Some analytic philosophers held that philosophical problems arise through misuse of language or because of misunderstandings of the logic of human language. In 1921, Ludwig Wittgenstein, who studied under Russell at Cambridge, published his Tractatus Logico-Philosophicus, which gave a rigidly "logical" account of linguistic and philosophical issues. Years later, he reversed a number of the positions he set out in the Tractatus, in for example his second major work, Philosophical Investigations (1953). Investigations was influential in the development of "ordinary language philosophy," which was promoted by Gilbert Ryle, J.L. Austin, and a few others. In the United States, meanwhile, the philosophy of Willard Van Orman Quine was having a major influence, with the paper "Two Dogmas of Empiricism". In that paper Quine criticizes the distinction between analytic and synthetic statements, arguing that a clear conception of analyticity is unattainable. Notable students of Quine include Donald Davidson and Daniel Dennett. The later work of Russell and the philosophy of Willard Van Orman Quine are influential exemplars of the naturalist approach dominant in the second half of the 20th century. But the diversity of analytic philosophy from the 1970s onward defies easy generalization: the naturalism of Quine and his epigoni was in some precincts superseded by a "new metaphysics" of possible worlds, as in the influential work of David Lewis. Recently, the experimental philosophy movement has sought to reappraise philosophical problems through social science research techniques. Some influential figures in contemporary analytic philosophy are: Timothy Williamson, David Lewis, John Searle, Thomas Nagel, Hilary Putnam, Michael Dummett, Peter van Inwagen, Saul Kripke and Patricia Churchland. Analytic philosophy has sometimes been accused of not contributing to the political debate or to traditional questions in aesthetics. However, with the appearance of A Theory of Justice by John Rawls and Anarchy, State, and Utopia by Robert Nozick, analytic political philosophy acquired respectability. Analytic philosophers have also shown depth in their investigations of aesthetics, with Roger Scruton, Nelson Goodman, Arthur Danto and others developing the subject to its current shape. Continental philosophy is a set of 19th- and 20th-century philosophical traditions from mainland Europe. 20th-century movements such as German idealism, phenomenology, existentialism, modern hermeneutics, critical theory, structuralism, post-structuralism and others are included within this loose category. While identifying any non-trivial common factor in all these schools of thought is bound to be controversial, Michael E. Rosen has hypothesized a few common Continental themes: that the natural sciences cannot replace the human sciences; that the thinker is affected by the conditions of experience (one's place and time in history); that philosophy is both theoretical and practical; that metaphilosophy or reflection upon the methods and nature of philosophy itself is an important part of philosophy proper. The founder of phenomenology, Edmund Husserl, sought to study consciousness as experienced from a first-person perspective, while Martin Heidegger drew on the ideas of Kierkegaard, Nietzsche, and Husserl to propose an unconventional existential approach to ontology. Phenomenologically oriented metaphysics undergirded existentialism—Martin Heidegger, Jean-Paul Sartre, Maurice Merleau-Ponty, Albert Camus—and finally post-structuralism—Gilles Deleuze, Jean-François Lyotard (best known for his articulation of postmodernism), Michel Foucault, Jacques Derrida (best known for developing a form of semiotic analysis known as deconstruction). The psychoanalytic work of Sigmund Freud, Carl Jung, Jacques Lacan, Julia Kristeva, and others has also been influential in contemporary Continental thought. Conversely, some philosophers have attempted to define and rehabilitate older traditions of philosophy. Most notably, Hans-Georg Gadamer and Alasdair MacIntyre have both, albeit in different ways, revived the tradition of Aristotelianism. Although they did not use the term, the 19th-century philosophers Søren Kierkegaard and Friedrich Nietzsche are widely regarded as the fathers of existentialism. Their influence, however, has extended beyond existentialist thought. Transcendental idealism, advocated by Immanuel Kant, is the view that there are limits on what can be understood, since there is much that cannot be brought under the conditions of objective judgment. Kant wrote his Critique of Pure Reason (1781–1787) in an attempt to reconcile the conflicting approaches of rationalism and empiricism, and to establish a new groundwork for studying metaphysics. Although Kant held that objective knowledge of the world required the mind to impose a conceptual or categorical framework on the stream of pure sensory data—a framework including space and time themselves—he maintained that things-in-themselves existed independently of human perceptions and judgments; he was therefore not an idealist in any simple sense. Kant's account of things-in-themselves is both controversial and highly complex. Continuing his work, Johann Gottlieb Fichte and Friedrich Schelling dispensed with belief in the independent existence of the world, and created a thoroughgoing idealist philosophy. The most notable work of this German idealism was G.W.F. Hegel's Phenomenology of Spirit, of 1807. Hegel admitted his ideas were not new, but that all the previous philosophies had been incomplete. His goal was to correctly finish their job. Hegel asserts that the twin aims of philosophy are to account for the contradictions apparent in human experience (which arise, for instance, out of the supposed contradictions between "being" and "not being"), and also simultaneously to resolve and preserve these contradictions by showing their compatibility at a higher level of examination ("being" and "not being" are resolved with "becoming"). This program of acceptance and reconciliation of contradictions is known as the "Hegelian dialectic". Philosophers influenced by Hegel include Ludwig Andreas Feuerbach, who coined the term projection as pertaining to humans' inability to recognize anything in the external world without projecting qualities of ourselves upon those things; Karl Marx; Friedrich Engels; and the British idealists, notably T.H. Green, J.M.E. McTaggart and F.H. Bradley. Few 20th-century philosophers have embraced idealism. However, quite a few have embraced Hegelian dialectic. Immanuel Kant's "Copernican Turn" also remains an important philosophical concept today. Marxism is a method of socioeconomic analysis, originating from Karl Marx and Friedrich Engels. It analyzes class relations and societal conflict using a materialist interpretation of historical development and a dialectical view of social transformation. Marxist analyses and methodologies influenced political ideologies and social movements. Marxist understandings of history and society were adopted by academics in archaeology, anthropology, media studies, political science, theater, history, sociology, art history and theory, cultural studies, education, economics, geography, literary criticism, aesthetics, critical psychology and philosophy. Edmund Husserl's phenomenology was an ambitious attempt to lay the foundations for an account of the structure of conscious experience in general. An important part of Husserl's phenomenological project was to show that all conscious acts are directed at or about objective content, a feature that Husserl called intentionality. Husserl published only a few works in his lifetime, which treat phenomenology mainly in abstract methodological terms; but he left an enormous quantity of unpublished concrete analyses. Husserl's work was immediately influential in Germany, with the foundation of phenomenological schools in Munich and Göttingen. Phenomenology later achieved international fame through the work of such philosophers as Martin Heidegger (formerly Husserl's research assistant), Maurice Merleau-Ponty, and Jean-Paul Sartre. Through the work of Heidegger and Sartre, Husserl's focus on subjective experience influenced aspects of existentialism. Inaugurated by the linguist Ferdinand de Saussure, structuralism sought to clarify systems of signs through analyzing the discourses they both limit and make possible. Saussure conceived of the sign as being delimited by all the other signs in the system, and ideas as being incapable of existence prior to linguistic structure, which articulates thought. This led Continental thought away from humanism, and toward what was termed the decentering of man: language is no longer spoken by man to express a true inner self, but language speaks man. Structuralism came to dominate Continental philosophy throughout the 1960s and early 1970s, encompassing thinkers as diverse as Claude Lévi-Strauss, Roland Barthes and Jacques Lacan. Post-structuralism came to predominate from the 1970s onwards, including thinkers such as Michel Foucault, Jacques Derrida, Gilles Deleuze and even Roland Barthes; it incorporated a critique of structuralism's limitations. Pragmatism is a philosophical tradition that began in the United States around 1870. It asserts that the truth of beliefs consists in their usefulness and efficacy rather than their correspondence with reality. Charles Sanders Peirce and William James were its co-founders and it was later modified by John Dewey as instrumentalism. Since the usefulness of any belief at any time might be contingent on circumstance, Peirce and James conceptualized final truth as something established only by the future, final settlement of all opinion. For Peirce commitment to inquiry was essential to truth-finding, implied by the idea and hope that inquiry is not fruitless. The interpretation of these principles has been subject to discussion ever since. Peirce's maxim of pragmatism is, "Consider what effects, which might conceivably have practical bearings, we conceive the object of our conception to have. Then, our conception of these effects is the whole of our conception of the object." Critics accused pragmatism falling victim to a simple fallacy: that because something that is true proves useful, that usefulness is an appropriate basis for its truthfulness. Pragmatist thinkers include Dewey, George Santayana, and C. I. Lewis. Pragmatism was later worked on by neopragmatists Richard Rorty (who was the first to develop neopragmatist philosophy in his Philosophy and the Mirror of Nature (1979)), Hilary Putnam, W. V. O. Quine, and Donald Davidson. Neopragmatism has been described as a bridge between analytic and Continental philosophy. Process philosophy is a tradition beginning with Alfred North Whitehead, who began teaching and writing on process and metaphysics when he joined Harvard University in 1924. This tradition identifies metaphysical reality with change. Largely Aristotelian in its approach and content, Thomism is a philosophical tradition that follows the writings of Thomas Aquinas. His work has been read, studied and disputed since the 13th century, especially by Roman Catholics. Aquinas enjoyed a revived mainstream interest beginning in contemporary philosophy, among both atheists (Philippa Foot) and theists (Elizabeth Anscombe). Thomist philosophers tend to be rationalists in epistemology, as well as metaphysical realists and virtue ethicists. They claim that humans are rational animals whose good can be known by reason that can be achieved by the will. Thomists argue that soul or psyche is real and immaterial but inseparable from matter in organisms. Soul is the form of the body. Thomists accept Aristotle's causes as natural, including teleological or final causes. In this way, although Aquinas argued that whatever is in the intellect begins in the senses, natural teleology can be discerned with the senses and abstracted from nature through induction. Contemporary Thomism encompasses multiple variants, from neo-scholasticism to existential Thomism. The so-called new Natural lawyers like Grisez and George applied Thomistic legal principles to contemporary ethical debates, while Freeman proposed that Thomism's cognition was most compatible with neurodynamics. Analytical Thomism (Haldane) encourages dialogue between analytic philosophy and broadly Aristotelian philosophy of mind, psychology and hylomorphic metaphysics. Other contemporary Thomists include Stump, MacIntyre and Finnis. Western philosophers have often been divided into some major branches, or schools, based either on the questions typically addressed by people working in different parts of the field, or notions of ideological undercurrents. In the ancient world, the most influential division of the subject was the Stoics' division of philosophy into logic, ethics, and physics (conceived as the study of the nature of the world, and including both natural science and metaphysics). In contemporary philosophy, specialties within the field are more commonly divided into metaphysics, epistemology, ethics and aesthetics (the latter two of which together comprise axiology, or value theory). Logic is sometimes included as a main branch of philosophy, sometimes as a separate science philosophers happen to work on, and sometimes just as a characteristically philosophical method applying to all branches of philosophy. Within these broad branches there are now numerous sub-disciplines of philosophy. At the broadest level there is the division between analytic (the English-speaking world and Nordic countries) and Continental philosophy (in the rest of Europe). For Continental philosophy subdividing philosophy between "experts" is problematic for the very nature of the interdisciplinary task of philosophy itself; however, for most of analytic philosophy further divisions simplify the task for philosophers in each area. The interest in particular sub-disciplines waxes and wanes over time; sometimes sub-disciplines become particularly hot topics and can occupy so much space in the literature that they almost seem like major branches in their own right. (Over the past 40 years or so philosophy of mind—which is, generally speaking, mainly a sub-discipline of metaphysics—has taken on this position within analytic philosophy, and has attracted so much attention that some suggest philosophy of mind as the paradigm for what contemporary analytic philosophers do). Originally the term "philosophy" was applied to all intellectual endeavors. Aristotle studied what would now be called biology, meteorology, physics, and cosmology, alongside his metaphysics and ethics. Even in the eighteenth century physics and chemistry were still classified as "natural philosophy", that is, the philosophical study of nature. Today these latter subjects are popularly referred to as sciences, and as separate from philosophy. But the distinction is not clear; some philosophers still contend that science retains an unbroken — and unbreakable — link to philosophy. More recently, psychology, economics, sociology, and linguistics were once the domain of philosophers insofar as they were studied at all, but now have only a weaker connection with the field. In the late twentieth century cognitive science and artificial intelligence could be seen as being forged in part out of "philosophy of mind." Philosophy is done primarily through self-reflection and critical thinking. It does not tend to rely on experiment. However, in some ways philosophy is close to science in its character and method; some analytic philosophers have suggested that the method of philosophical analysis allows philosophers to emulate the methods of natural science; Quine holds that philosophy does no more than clarify the arguments and claims of other sciences. This suggests that philosophy might be the study of meaning and reasoning generally; but some still would claim either that this is not a science, or that if it is it ought not to be pursued by philosophers. This is an active discipline pursued by both trained philosophers and scientists. Philosophers often refer to, and interpret, experimental work of various kinds (as in philosophy of physics and philosophy of psychology), but such branches of philosophy aim at philosophical understanding of experimental work. Philosophers do not perform experiments and formulate scientific theories qua philosophers. Like philosophy, most religious studies are not experimental. Parts of theology, including questions about the existence and nature of gods, clearly overlap with philosophy of religion. Aristotle considered theology a branch of metaphysics, the central field of philosophy, and most philosophers before the twentieth century have devoted significant effort to theological questions. So the two are not unrelated. But other parts of religious studies, such as the comparison of different world religions, can be easily distinguished from philosophy in just the way that any other social science can be distinguished from philosophy. These are closer to history and sociology, and involve specific observations of particular phenomena, here particular religious practices. The philosophy of mathematics is a branch of philosophy of science; but in many ways mathematics has a special relationship to philosophy. This is because the study of logic is a central branch of philosophy, and mathematics is a paradigmatic example of logic. In the late nineteenth and twentieth centuries, logic made great advances, and mathematics has been proven to be reducible to logic (at least, to first-order logic with some set theory). The use of formal, mathematical logic in philosophy now resembles the use of mathematics in science, although it is not as frequent. ^ West, Thomas G., and Platon. Plato's Apology of Socrates: an interpretation, with a new translation. Ithaca, NY: Cornell University Press, 1979. ^ Frederick Copleston, A History of Philosophy, Volume II: From Augustine to Scotus (Burns & Oates, 1950), p. 1, dates medieval philosophy proper from the Carolingian Renaissance in the eighth century to the end of the fourteenth century, though he includes Augustine and the Patristic fathers as precursors. Desmond Henry, in Edwards 1967, pp. 252–257 volume 5, starts with Augustine and ends with Nicholas of Oresme in the late fourteenth century. David Luscombe, Medieval Thought (Oxford University Press, 1997), dates medieval philosophy from the conversion of Constantine in 312 to the Protestant Reformation in the 1520s. Christopher Hughes, in A.C. Grayling (ed. ), Philosophy 2: Further through the Subject (Oxford University Press, 1998), covers philosophers from Augustine to Ockham. Gracia 2008, p. 620 identifies medieval philosophy as running from Augustine to John of St. Thomas in the seventeenth century. Kenny 2012, volume II begins with Augustine and ends with the Lateran Council of 1512. ^ Schmitt & Skinner 1988, p. 5, loosely define the period as extending "from the age of Ockham to the revisionary work of Bacon, Descartes and their contemporaries. ^ Gracia, Jorge J.E. Philosophy 2: Further through the Subject. p. 621. the humanists … restored man to the centre of attention and channeled their efforts to the recovery and transmission of classical learning, particularly in the philosophy of Plato. in Bunnin & Tsui-James 2008. ^ Schmitt & Skinner 1988, pp. 61, 63: "From Petrarch the early humanists learnt their conviction that the revival of humanae literae was only the first step in a greater intellectual renewal" […] "the very conception of philosophy was changing because its chief object was now man—man was at centre of every inquiry." ^ Brian Leiter (ed. ), The Future for Philosophy, Oxford University Press, 2006, p. 44 n. 2. ^ "Hobbes: Moral and Political Philosophy". Internet Encyclopedia of Philosophy. "Hobbes is the founding father of modern political philosophy. Directly or indirectly, he has set the terms of debate about the fundamentals of political life right into our own times." ^ Rutherford 2006, p. xiii, defines its subject thus: "what has come to be known as "early modern philosophy"—roughly, philosophy spanning the period between the end of the sixteenth century and the end of the eighteenth century, or, in terms of figures, Montaigne through Kant." Nadler 2008, p. 1, likewise identifies its subject as "the seventeenth and eighteenth centuries. Kenny 2012, p. 107, introduces "early modern philosophy" as "the writings of the classical philosophers of the seventeenth and eighteenth centuries in Europe". ^ Anthony Kenny, A New History of Western Philosophy, vol. 3 (Oxford University Press, 2006), p. xii: "To someone approaching the early modern period of philosophy from an ancient and medieval background the most striking feature of the age is the absence of Aristotle from the philosophic scene." ^ a b Richard Schacht, Classical Modern Philosophers: Descartes to Kant, Routledge, 2013, p. 1: "Seven men have come to stand out from all of their counterparts in what has come to be known as the 'modern' period in the history of philosophy (i.e., the seventeenth and eighteenth centuries): Descartes, Spinoza, Leibniz, Locke, Berkeley, Hume and Kant". ^ Bruce Kuklick, "Seven Thinkers and How They Grew: Descartes, Spinoza, Leibniz; Locke, Berkeley, Hume; Kant" in Rorty, Schneewind, and Skinner (eds. ), Philosophy in History (Cambridge University Press, 1984), p. 125: "Literary, philosophical, and historical studies often rely on a notion of what is canonical. In American philosophy scholars go from Jonathan Edwards to John Dewey; in American literature from James Fenimore Cooper to F. Scott Fitzgerald; in political theory from Plato to Hobbes and Locke […] The texts or authors who fill in the blanks from A to Z in these, and other intellectual traditions, constitute the canon, and there is an accompanying narrative that links text to text or author to author, a 'history of' American literature, economic thought, and so on. The most conventional of such histories are embodied in university courses and the textbooks that accompany them. This essay examines one such course, the History of Modern Philosophy, and the texts that helped to create it. If a philosopher in the United States were asked why the seven people in my title comprise Modern Philosophy, the initial response would be: they were the best, and there are historical and philosophical connections among them." ^ Rutherford 2006, p. 1: "epistemology assumes a new significance in the early modern period as philosophers strive to define the conditions and limits of human knowledge." ^ Karl Ameriks, Kant's Elliptical Path, Oxford University Presss, 2012, p. 307: "The phenomenon of late modern philosophy can be said to have begun right around the pivotal year of 1781, when Kant's Critique of Pure Reason appeared. It was around this time that German thought started to understand itself as existing in a period when philosophy's main traditional options appeared to have been played out, and it no longer seemed appropriate to define oneself as simply modern or enlightened." ^ Baldwin 2003, p. Western philosophy, p. 4, at Google Booksby the 1870s Germany contained much of the best universities in the world. […] There were certainly more professors of philosophy in Germany in 1870 than anywhere else in the world, and perhaps more even than everywhere else put together. ^ Beiser, Frederick C., The Cambridge Companion to Hegel (Cambridge, 1993), page 2. ^ Frederick C. Beiser, German Idealism: The Struggle Against Subjectivism, 1781–1801, Harvard University Press, 2002, p. viii: "the young romantics—Hölderlin, Schlegel, Novalis—[were] crucial figures in the development of German idealism." ^ Baldwin 2003, p. 119: "within a hundred years of the first stirrings in the early nineteenth century [logic] had undergone the most fundamental transformation and substantial advance in its history." ^ Nicholas Joll, "Contemporary Metaphilosophy"
^ Russell, Bertrand (22 February 1999). "The Principles of Mathematics (1903)". Fair-use.org. Retrieved 22 August 2010. ^ Michael Rosen, "Continental Philosophy from Hegel", in A. C. Grayling (ed. ), Philosophy 2: Further through the Subject, Oxford University Press (1998), p. 665. ^ Religious thinkers were among those influenced by Kierkegaard. Christian existentialists include Gabriel Marcel, Nicholas Berdyaev, Miguel de Unamuno, and Karl Jaspers (although he preferred to speak of his "philosophical faith"). The Jewish philosophers Martin Buber and Lev Shestov have also been associated with existentialism. ^ Dreyfus, Hubert L.; Wrathall, Mark A. (2011). A Companion to Phenomenology and Existentialism. John Wiley & Sons. ISBN 978-1-4443-5656-4. ^ Pragmatism (Stanford Encyclopedia of Philosophy). 13 September 2013. Retrieved 13 September 2013. ^ Peirce, C.S. (1878), "How to Make Our Ideas Clear", Popular Science Monthly, v. 12, 286–302. Reprinted often, including Collected Papers v. 5, paragraphs 388–410 and Essential Peirce v. 1, 124–41. See end of §II for the pragmatic maxim. See third and fourth paragraphs in §IV for the discoverability of truth and the real by sufficient investigation. Also see quotes from Peirce from across the years in the entries for "Truth" and "Pragmatism, Maxim of..." in the Commens Dictionary of Peirce's Terms, Mats Bergman and Sami Paavola, editors, University of Helsinki. ^ William Egginton/Mike Sandbothe (eds.). The Pragmatic Turn in Philosophy. Contemporary Engagement between Analytic and Continental Thought. SUNY Press. 2004. Back cover. ^ "Alfred North Whitehead (Internet Encyclopedia of Philosophy)". ^ William Blattner, "Some Thoughts About "Continental" and "Analytic" Philosophy"
^ Seibt, Johanna. "Process Philosophy". In Zalta, Edward N. Stanford Encyclopedia of Philosophy. ^ Kerr, Fergu (2008). After Aquinas: Versions of Thomism. John Wiley & Sons. ISBN 978-1-4051-3714-0. ^ Feser, Edward (2009). Aquinas: A Beginner's Guide. Oneworld Publications. p. 216. ISBN 978-1-85168-690-2. ^ Paterson, Craig; Pugh, Matthew S. (2006). Analytical Thomism: Traditions in Dialogue. Ashgate. ISBN 978-0-7546-3438-6. Kenny, Anthony. A New History of Western Philosophy (Oxford University Press, 2012). Copleston, Frederick (1946–1975). A History of Philosophy. Great Britain: Continuum. Hegel, Georg Wilhelm Friedrich (1996) [1892 Kegan Paul]. Haldane, Elizabeth Sanderson, ed. Vorlesungen über die Geschichte der Philosophie [Hegel's Lectures on the history of philosophy 3 vols.]. Humanities Press International. Glyn Hughes' Squashed Philosophers – abridged versions of classic philosophy texts.